How much should I tip the servers at a buffet restaurant? Dear Salty: A few years ago, friends and I ate at a buffet, and at the end of the meal, the server who’d brought our coffee and soda was angry that we didn’t leave a tip for the entire price of the meal (which was considerable since there were nine people). So she followed us to the parking lot and threw the tip at us! Years later, I’m still irritated and perplexed. We didn’t mean to stiff her, but geez, we served ourselves the food. What is the protocol in the tipping department (not the parking lot department)? In all my years waiting tables, I’ve never angrily stalked a customer to the parking lot. (Whether or not I’ve thought about it is another issue…) I’m sorry that happened to you. I’m guessing the server saw your table as the last straw on an already bad day. Still, sheesh—get a grip, girlfriend. 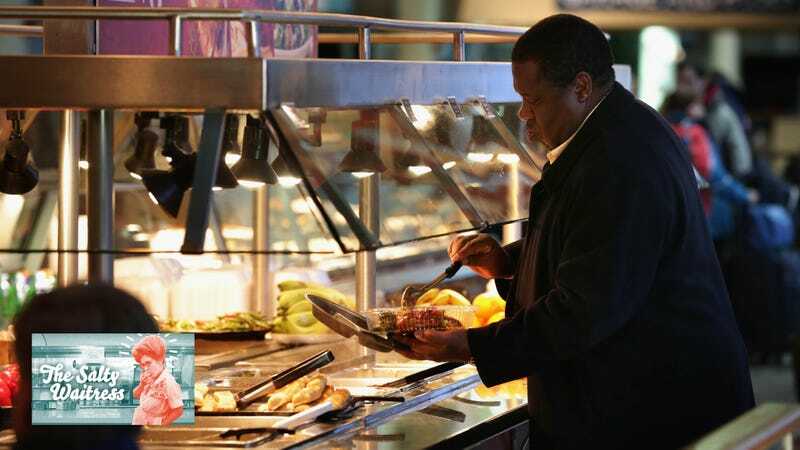 Tipping at buffets is tricky because they vary from place to place in terms of how much work staff does. At some places, they only bring your water or soda. At others, they might clear plates, check on you a few times, refill drinks, etc. Also, tips for buffet servers are sometimes shared with the food runners who refill the buffet’s chafing dishes. So it’s up to you to keep a little bit of an eye on how much work your staff is doing. And tipping’s golden rule still applies: If they do a great job, leave a few extra bucks. That said, the standard tip at a buffet is 10 percent. (Her highness Emily Post backs me up here.) If you refill your own drinks at a soda machine and no one clears your plates, you could maybe knock this down a bit. But remember that there are tasks the staff is doing “behind the scenes”—making sure forks and napkins are well-stocked, resetting tables, etc.—so some gratuity is a good idea. Even if you did undertip, though, there’s no reason for the server to take her ’tude to the parking lot.